Tallgrass Prairie has been called the single most threatened ecosystem on the North American continent. Often cited as having only 2% of the former acreages remaining, there is a very strong argument behind the evidence. Sadly, Iowa and Illinois are prime examples of the destruction. But keep in mind, this bird exploded in population when the prairies first began to be plowed and opened up for early agriculture. So there was a tipping point and in time we can see this as about 1860-1866. The trick to keeping Prairie Chickens is to find a new balance while restoring diversity at every level. Let’s look at the current threats which are causing declines. Once a farmer sprays a piece of ground, then tilling of some kind normally results. Then they plow or disc it. The next time it is sprayed with herbicides the seed bank is gone and natural regeneration controlled by nature instead on man is impossible. Tame hay like timothy, brome and other grasses are acceptable for prairie chickens. Fescue is perhaps the worst grass every to have been planted on this continent. Once an area of less than a size close to 250,000 acres is destroyed then decline sets in. To maintain these birds, "The Grassland Conservation Plan for Prairie Grouse" recommends an area of 225, 000 acres to sustain healthy populations. That is the definition of an umbrella species. You have to have so much land for that one species that by providing for healthy prairie chicken populations, you sustain the Upland Sandpipers, the Henslow's Sparrows, the Northern Harriers, and other species which depend on native grasslands. The umbrella species protects a myriad of life through our protection of the habitat requirements of that single species. As vast amounts of acreage were put into agriculture and prairies shrunk to tiny fragments of their once abundance, they naturally became isolated from one another. When groups of any living organisms are separated by insurmountable distances, that group becomes weakened through lack of genetic diversity. In the last few years, after Conservation Reserve Programs ( CRP) became totally non-competitive for farmers, we lost millions of acres of grass. In Minnesota where Dr. John Toepfer and others have monitored the success of prairie chickens using CRP grasslands, we are now seeing declines. Once a group of birds like in Illinois becomes totally isolated from other populations the genetic diversity begins to decline and the result is that particular population becomes fragile resulting in decline. In Illinois, there were the costs to trap and will soon exceed the cost of buying farms nearby and converting them back to native grasses. The Nature Conservancy's Nachusa Grassland is an ideal example of outstanding restoration. But it is isolated as well. Agriculture systems which cause vast Monoculture "habitats"
By creating a monoculture of anything, we get the results of that habitat. Huge numbers of only a few species. There are only so many species that can live on a "golf course" habitat. Not very different from the preceding section. Fire removes a lot of the organic material because it floats off as carbon in smoke. Soils are affected because in shallow soils fire kills the living microbes important to building the soils through the integration of organic material into the fertile humus. 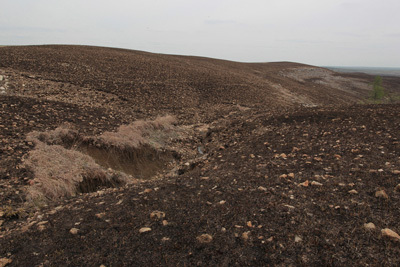 The results of the combined grazing patterns and over use of fire is apparent in the rock strewn hillsides of the Flint Hills of Kansas. Wind, rain or by any means the organic humus in topsoil are perhaps America’s most valuable asset. Estimates are that even no-till soils lose an average of 3 tons per acre per year. Spraying native grasslands to eliminate anything other than grass to “improve” forage for cattle. Why is this such a problem? Because herbicides kill the seed bank which exists in the soils naturally. Weeds are one thing, but if farmers and rancher are declaring "war of eradication" on the native seeds that exist lying dormant often for years upon years, then that eliminates vital diversity.